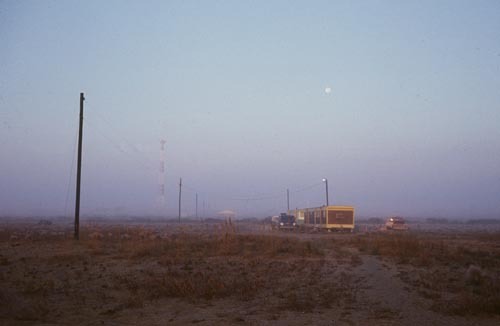 I have spent a few thousand nights in Rodanthe. 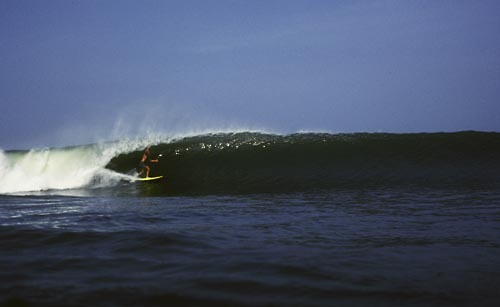 As a young man, fresh out of college, I relocated there from Northern Virginia, via Bethany Beach, Delaware where I had befriended a small group of surfers. From there I made surfing trips to Hatteras, only to disappoint myself by returning to the mundane life up north. I was at an age where I was trying to find myself. Hatteras Island seemed like a great place to do just that, and besides I could surf beautiful waves while I did my thinking. A perfect setup on a Rodanthe sand bar, compliments of hurricane Gabrielle. 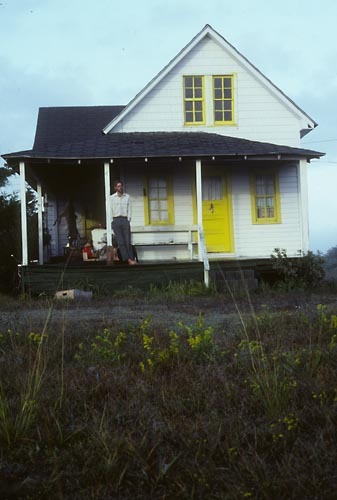 In 1973, I moved into a small house with friends, Mike and Mary Jo, along with my best surfing buddy, Louie. Our landlords were Valton and Lovie Midgett. Close by, there was a great surfing break out on the “outside bar”. An old wrecked LST stabilized the bottom for the most consistent waves. The ride was much like surfing a point break. In those days, Rodanthe was relatively untouched by development, so a handful of us were the only ones there to enjoy the bounty. Valton and Lovie Midgett’s house. A few months later, Louie and I moved to a trailer in the adjacent town of Waves. We rented from a local man named Luke Midgett. His family roots were deeply planted there. Our trailer was in an open field at the oceanfront. We surfed our brains out, and worked odd jobs to pay our expenses, including rent of $150 a month, split 2 ways. It was a life close to the elements, and we loved it. Today there’s nothing but rows of rental houses on the site. I lived there for almost 3 years until I relocated to Salvo, the town adjacent to Waves. Moving from one trailer to another trailer, this next one was newer and bigger, so I reserved the largest bedroom for my first official darkroom. Thus began my humble living as a photographer, even though it was part time. 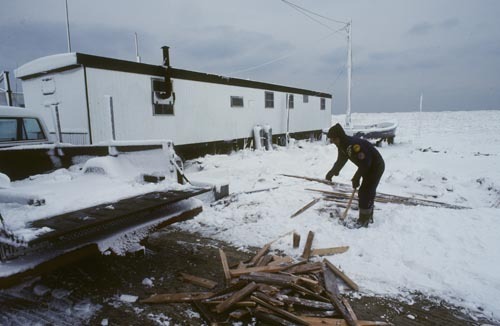 I honed other skills like woodworking, commercial fishing, and waterfowl hunting to get by. All along, I was teaching myself to make color prints, doing some shows and exhibits. Things were definitely picking up. This time I rented from a lady named Barbara Midgett. To help defray living expenses, my good friend BJ moved in some time later. BJ chopping for our preferred mode of heating. Wood was an abundant fuel source. It washed in on the beach and all we needed to do was to collect it. 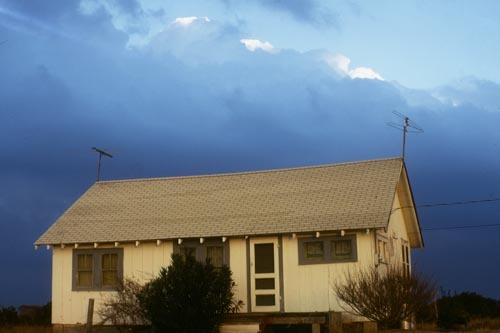 After another 3 years, I found a larger house to rent in north Rodanthe. It was 1978. In the front rooms, I built a big darkroom with a gallery space next to it, then placed a sign out front on highway 12. I was open for business. Rodanthe, Waves and Salvo still was experiencing very little development. But now I was somehow able to pay most of my way with photography, and I loved taking pictures, printing and hanging them. I also loved the local people that lived there. 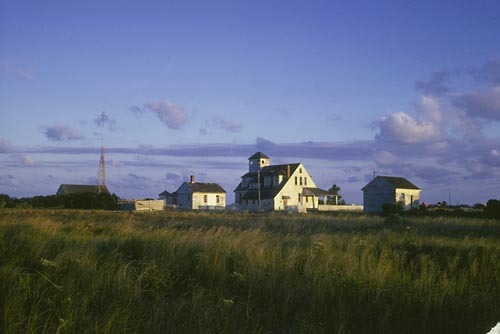 The view from my bedroom window was the Chicamacomico Lifesaving Station, decommissioned in 1954. My friend Robin, lived in a hundred year old house across the street. He hunted, fished and surfed much as I did. Mainstream America still had not discovered Rodanthe, Waves and Salvo. Life was good and uncrowded. We experienced storms, floods and big waves. A few surfing friends came down for visits. It was a simple, yet full and rewarding life. My photography gallery was working better and better, so I began “working” full time photographing the environment around me. Robin Gerald was my alter ego. Burgess Hooper always fished with Princess. 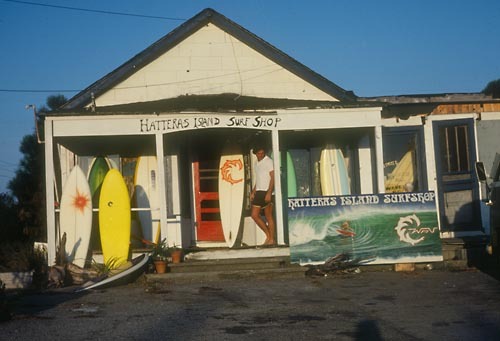 Barton Decker at the original Hatteras Island Surf Shop, circa 1978. For about 5 years, I worked as a waterfowl hunting guide along side Burt Hooper. He learned the craft from his father, Ed. 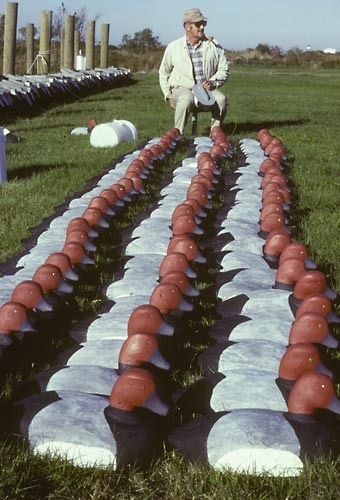 Here he ties off some of the 200 redhead duck decoys that I took 8 months to paint. It was gratifying to see dense flocks of waterfowl pitch in to these hunting rigs. In 1985 I finally bought a piece of land from Miss Lillian Midgett. It was on the scenic Pamlico Sound side of the island. This is where I began plans to build my studio home. It was the beginning of the end of my nights in Rodanthe. But that is another chapter in my life. 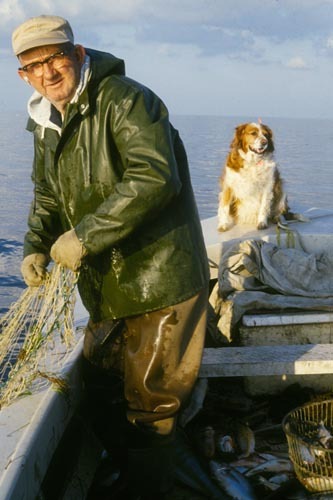 This entry was posted in buildings, commercial fishing, boat, pamilco sound, gillnetting, Land, People, Sea on April 29, 2009 by j0jgvm89bj.